Why are wedding dresses all cut to fit girls who have a lot flatter stomachs than me? Should I go on a wedding diet? The answer: yes. Will I? No. Also, why would anyone want to spend that much on a very uncomfortable dress that they're going to wear once? Why do movies depict dress shopping as magical and beautiful when really it's sweaty and awkward? How many places is too many places to register? Does anyone I know that is rich actually love me enough to buy me an almost $400 KitchenAid stand mixer? Why do I suddenly want a KitchenAid mixer now that I'm getting married? Why does everything Kate Spade have to cost so much? Okay but how much did they spend on those center pieces? If I post my own pictures on Pinterest, how many pins do you think they'll get? If I send an invite to Andy Grammer, do you think he'll come like Taylor Swift did with that one random fan? Alternatively, if I send one to Taylor Swift, do you think she'll come like she did with that one random fan? Do girls literally revolve their wedding date around their menstural cycle? Because I tend to avoid white always, whether anywhere near my period or not. What if some of my best friends can't come? I'm sorry to all the people in Texas that won't be able to make it. I can't wait to instagram these pictures for the rest of my life. This is honestly the only thing I care about other than my fiancé. How do I include my cat in our photos? I don't even like cake. Also, I know I'm marrying the right man because neither of us want cake shoved in our faces. I've had ideas for a wedding hashtag ready for months. I've wanted Chipotle to cater my wedding since I was like 14 (I'm sure my hometown friends can verify). How many self-help books can I read in the next few months? Will the fact that I studied marriage and family in college help me at all to have a successful marriage? I'm excited for pre-marital counseling! Can I just wear my natural hair? What if I chip my nail polish the day before I get married? Who wants to do my (natural) makeup for me? Do I want to get my hair dyed before engagements or wait until closer to my wedding? Woah. I'm going to be someone's wife. Do any of the boys that I dated before Jamison care that I'm getting married? 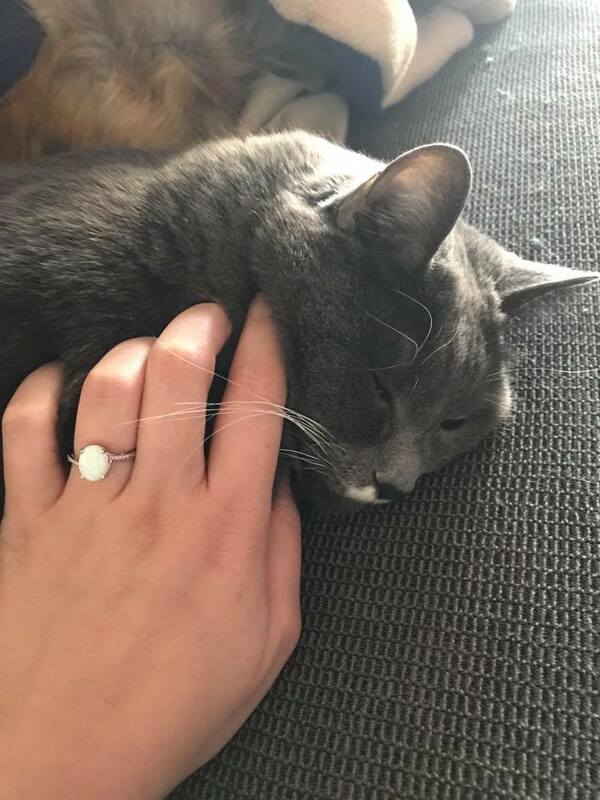 Does my cat care that I'm getting married? Again, how do I include my cat in this whole wedding thing? Wow, I love his family. Wow, I can't wait to marry him. Wow, I'm marrying my best friend. Wow, I must love him a lot to be able to fart in front of him. Wow, he's the hottest guy I've ever seen. Can't wait to kiss him for the rest of my life. 1. Even when you don't think that life can get any harder, watch out. Because it just might. I was sincerely convinced that nothing could be worse than losing my sister. Introducing: 2017. I was unemployed for 6 months, couch surfing (aka staying in Melissa's queen sized spare bed, quite the struggle) for one. My father passed away less than two years after my sister. I threw up on myself while sitting in the window seat of a full flight. My best friend and I got kicked out of her house during my vacation visit on Valentine's Day. I tried wheat pasta for like the first time in five years and it was just as disgusting as I remember. That sorta stuff. 2. You can't dwell on the negative. 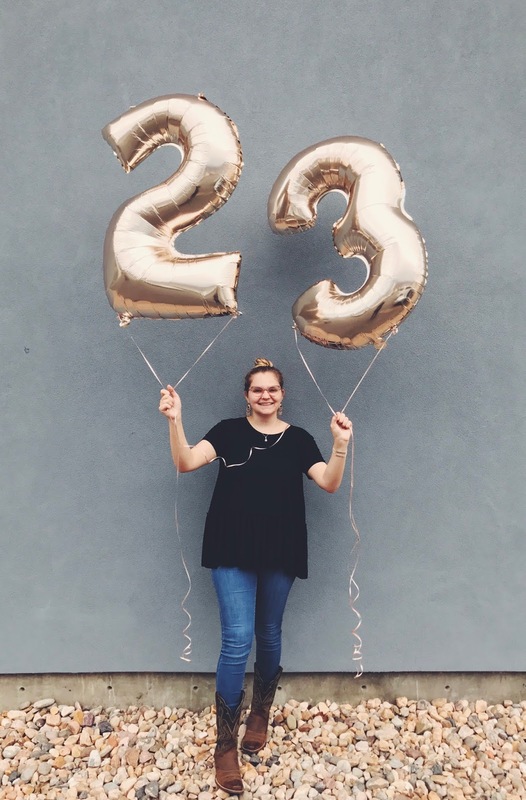 I experienced a lot of tender mercies in my 22nd year — the main one being Jamison. We met and fell in love. 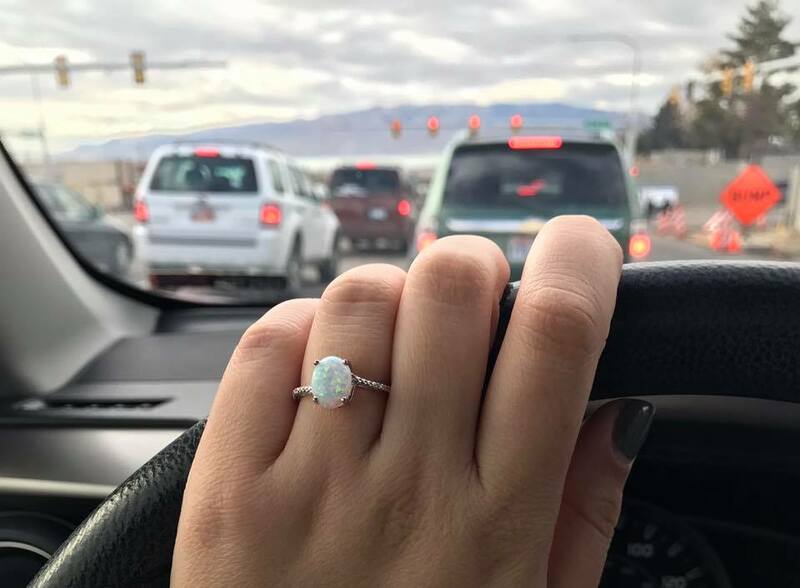 And now we're engaged to be married! I got to see my parents and brother when I walked at BYU commencement in April. I had amazing, beautiful, and patient roommates over the summer. I was there with my mother when my father passed. I met one of my dearest friends, Mandy. I grew closer with my cousin, Becky. I got to go to Disney World and Disneyland and see my best friend Alex for the first time in three years. 22 wasn't as bad as I made it seem. 3. People can do stupid things, but more importantly, people can change. We are all flawed — hey, we're only human, right? I trust that if I make a bad choice, my family and friends know that I'm not a bad person. And I give them that same respect. 4. Farting doesn't have to be the worst thing in the world! Sure, fart is a weird word. And nobody likes how they smell. But it's not the end of the world if you "pass gas" (as my parents so lovingly called it) in front of someone. Like, how dare you have a normal bodily function? Stop making it a big thing. 5. I definitely didn't listen to 22 by Taylor Swift enough this year. 6. Parents are people too. Sometimes it's hard to remember that yeah, your all-knowing mother hurts. She has struggles and pain. She is a child of God just as much as you are. So try to be kind, even if she (or he, or whoever you're thinking of as you read this) pisses you off. I'm sorry for my flaws, Mom. And thank you for choosing to ignore them. Also, my mom was super hot in the seventies. I love that lady. 7. I have a healthy amount of self-esteem. Sometimes I love myself, sometimes I hate myself. And that's okay. 8. God will always welcome you back with loving arms. After Julian died, I will be honest: I was pretty sure that God wasn't real. I had so many doubts swimming around in my head for a long time. I am doing better. I am trying. I am praying and reading the scriptures. I can see God's presence in my life, and I'd be stupid to deny it. He loves me and is there for me, even if I strayed away. 9. Entering Instagram giveaways isn't always futile. I've won two Sodalicious giveaways in the last year! Granted, I enter about a million other giveaways that I don't win, so I would like to publicly apologize to those I tag to enter. Related: if you ever want to tag me in giveaways hmu and we can make that our thing. 10. Some people just aren't meant to be forever friends. Sometimes you will only get a glimpse of the light someone brings to your life before your friendship may end for whatever reason. And that's okay. Just try to focus on the good memories, not the bad. 11. Being forward in dating is a-okay. There was this guy I was sorta dating last year. We vibed really well and he always seemed excited to see me again, but then he would be really flakey and wishy-washy. I eventually called him out on it and he admitted that I was right. I then told him he was going to pick me up the next day between such-and-such hours and take me on a date. It worked (until I met a better man, AKA Jamison). And I got free pizza. 12. Trust that an ending is followed by a beginning. Things work out how they're meant to. If a job didn't work out, one that you're meant to do will come along. If the boy you liked ghosted you even though you both loved Tangled and George Strait (you know who you are (also you're probably not reading this)) a hotter one will come along. There is a natural balance and order in the world and it will impact your life for the better. 13. I will never get over taking pictures of my cat. He's literally the cutest cat to ever exist. Also maybe the fattest. 14. The cousin's of people who no longer talk to me are always so nice? 15. Nobody and nothing can take the place of a good father. 16. Your past is not an excuse to treat the people that love you poorly. Everyone has been through crap. And yet, there are still good people in the world. You can't just tear down the ones who care about you and blame it on your past. We all struggle. 17. Working out will always be the worst. Also one time I pulled a muscle in my leg playing air hockey, so there's that. 18. I have a lot more friends than I think. Want to figure out how many amazing, phenomenal, beautiful gal pals you have? Get engaged and decide who to make your bridesmaids. I am so lucky to have so many loving and supportive women in my life, and if it wouldn't be so extra to have about 97 bridesmaids, I would (including my cat, Made of Honor style). I love y'all. 19. Go out of your comfort zone. You weren't meant to just float through life. Experience things! Kiss the boy! Chop off your hair! Eat the snails! Go fishing! Play Go Fish! Send that scary text! Post that selfie! Love yourself forever! Buy cute underwear! Wear crazy socks! Just do it! 20. A sure-fire way to show your love and cheer someone up is to send them a card. Not sure why letter-writing is becoming obsolete because I'm a huge fan. Hmu if you need some mail. My handwriting, gift giving, gift wrapping, animal whispering, eating too much food, and loving people. I'm not musical or athletic and that's totally fine. 22. Adults don't really have their lives together. Your parents are actually a mess, just like you and me. Don't stress if you're 22 and single and just want to stay at home with your cat always (been there). Everyone is just doing their best to get by, so be sure to help others get to the top. 23. Never ever ever take anyone for granted. Say please and thank you. Tell them you love them. Listen to their advice. Hug them tight. Serve one another. Here's to 23. This is gonna be my year. Oh my gosh! You're getting married! I feel ya!!!!!!! Can it just be wedding day already? Jamison. You're a little behind the times. 10 months at the moment! 2 brothers, 1 sister, 1 half-brother, 3 step-sisters, 3 step-brothers, 2 in-laws. He comes from what one might call a "big family." On Mutual. No, not at mutual. Mutual is what I lovingly refer to as "Tinder for Mormons." If you don't know what Tinder is, in simple words, it's a dating app. Sometimes it's okay to meet strangers from the internet (if they're as cute as mine). If you're thinking about using Mutual, I highly reccomend. Also my brother's on there somewhere so maybe you can marry him. No, not really. I feel like this happens with every guy that I've liked but he knows that it's non-negotiable for me. I will say that he isn't too happy that I've started refering to him as "Daddy" when talking to my cat since we got engaged. But he secretly loves him. What does he like, do? He works full-time right now! He is a musician. If you've read blogposts where I've referred to the fact that Julian would like him a lot, that's a huge reason why. I feel like they're kindred spirits. He's really smart and cute and fashionable and talented. He's definitely a movie buff like his dad. He likes dark chocolate. Pretty sure he's an alien, but whatever. Does he treat you well? Actually, I don't. But whatever. Do you like his family? Hate them. Just kidding. Wouldn't that be awkward? I'm actually low-key obsessed. This week I'm seeing them 6/7 days. I love them all. Especially his aunt & uncle's dog Howie. Has he met your family? Yes. We were dating when my parents and brother came up when I walked in the BYU commencement ceremony. He and his mom also drove from Utah to Texas for my dad's funeral. What Hogwarts house is he in? Slytherin. I like your priorities. Can I see your ring? Okay, yes, if you insist.